Can you explain briefly the type of work you carry out at present? I seemed to get stuck with just a few ideas and could not figure out something different to try. I got serious about figuring this out in 2006. I have enjoyed teaching these ideas as well as writing for the AAW Journal. I love working with black cherry (Prunus serotina). It smells wonderful, has tight grain with lots of character and has a beautiful colour. I love the many directions that people have gone in, from functional pieces to adding carving and texture and colour and piercing, and the many people who are exploring using many axes. The struggle that I have had is to not be competitive but to find my own passion and enjoy playing in my shop every day. I will continue to work with many axes and find ways to turn wood between centres without using jigs. I have recently acquired a few new tools and new strategies that make turning larger bowls and vessels easier as I age, so I look forward to continuing this as well. Only one?! My advice is to take classes to learn how to use the tools and the wood efficiently. And to then go home and turn and find your own voice. I just finished Cutting for Stone, a book by Abraham Verghese. I had lived in Ethiopia in the early â€˜70s and a friend had suggested this book, as it is set in Addis Ababa. I love all types of music and listen to classical on PBS or my favourite play list on iTunes. I just put a blank of cherry on the lathe today to turn an urn for a friend whose dog died suddenly. I have been wanting to turn a bowl or vessel using five or six twisted axes. I see now why I put off this idea, because balance becomes a bigger issue with a bigger piece of wood. So far, though, it is working. I think this will make a nice urn. 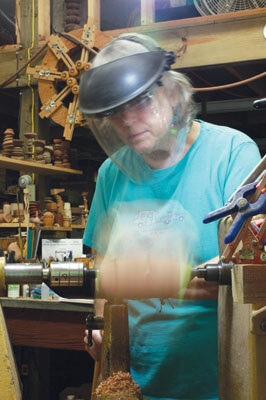 I love turning goblets and cups and other functional objects and then using them every day. I also enjoy making candleholders and bottle stoppers. Michael Hosaluk was my first teacher at Arrowmont School of Arts and Crafts in 1990. He is a great teacher, a fun loving guy, and his creativity knows no boundaries. David Ellsworth was my teacher at Arrowmont in 1992. 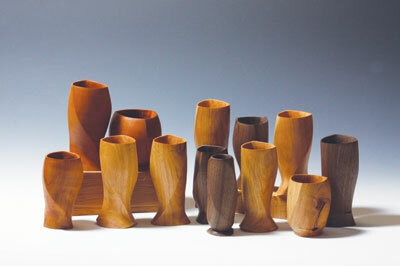 He has given the woodturning world not only great turnings but an understanding of the mechanics of turning. The AAW has helped give turning a voice in many ways. The journal, the symposiums and the turning clubs that have developed in the past 20 years have added a depth to the art form and have provided a social and learning structure for the people who turn. What do you see yourself doing in five yearsâ€™ time? I expect to be turning and teaching. The issue of copying or plagiarism was a big topic in the â€˜90s. I think this had a detrimental effect on many of us. 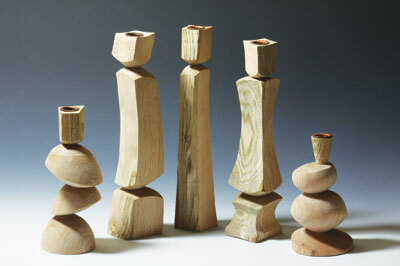 I believe that this constraint has loosened now and that people feel free to turn and carve and make things their own. What are your other interests besides turning? My friends and family and pets, playing and listening to music, and enjoying the outdoors. What three things in your workshop could you not do without? My lathe, bandsaw and my chainsaw.